A Pen That Will Always Be Returned | OhGizmo! Are you tired of telling people that they can borrow your pen as long as they promise to return it, but they never do? Well you can pretty much guarantee your co-workers will be less than willing to abscond with any of these pens. Instead of squirting ink or giving an electric shock like your standard gag pen, these ones are simply branded with fake businesses that have the potential of ruining someone’s reputation if they’re caught using them. Like Electrolysis Is Us or Verdant Fields Nudist Group or even Stuffed With Love Taxidermy. But because the fake businesses sound so… well… fake, there’s probably more of a chance that someone is going to actually keep one of these pens as a ‘hi-larious’ novelty item. So if you really are tired of people stealing your pens, I suggest doing what I do and take something of theirs as collateral until it’s returned. Like their car, their eldest son or even a beloved pet. Some people might think that’s a bit extreme (like that stupid jury) but it gives you a pretty solid bargaining chip if you ever want to see that 10 cent Bic ballpoint again. 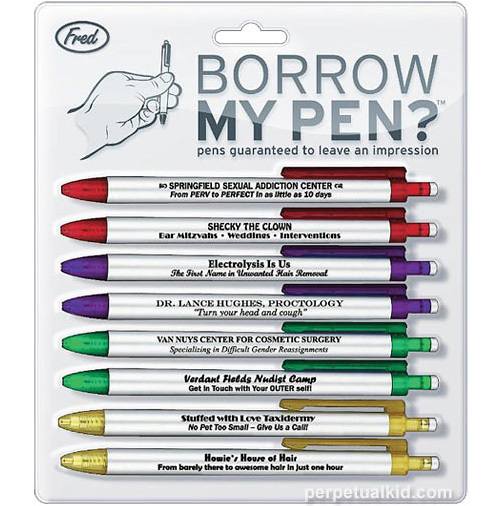 A set of 8 ‘Borrow My Pen?’ pens is available from Perpetual Kid for $6.99.